Jambavan also known as Jambavantha, is an eternal servant of Lord Ramacandra. He was the King of the Bears (Riksharaj). He helped Lord Ramacandra find His wife Srimati Sita devi and fight Her abductor, Ravana. He was instrumental in making realize Hanuman his immense capabilities and encouraged him to jump across the ocean to search for Sita in Lanka. Jambavan was present at the churning of the ocean, and circled Lord Vamana seven times in a brief time when Lord was acquiring the three worlds from Bali Maharaj. In his previous life, he was the King of the Himalayas who had incarnated as a bear in order to serve Lord Ramacandra. He had received a boon from Lord Ramacandra that he would have a long life, be handsome and would have the strength of ten million lions. Jambavan, together with Parasuram and Hanuman, was one of the few to have been present at the time when Lord Ramacandra appeared in Treta-yoga and Lord Krishna appeared in Dvapara-yuga. In the Mahabharata, Jambavan had killed a lion, who had acquired a gem called Syamantaka from Prasena after killing him. Lord Krishna was suspected of killing Prasena for the jewel, so Lord tracked Prasena’s steps until He learned that Prasena had been killed by a lion who had been killed by a bear. 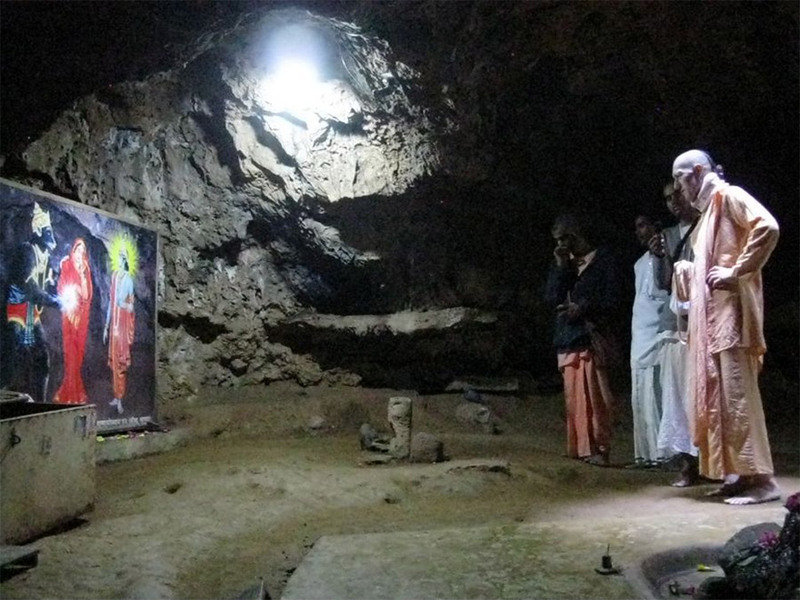 Lord Krishna tracked Jambavan to his cave. When the nurse of Jambavan’s child saw Krishna coming, she immediately thought He might take away the valuable Syamantaka jewel, and she cried out in fear. Jambavan heard her and went there in an angry mood. Seeing Krishna, he challenged Him to fight. Although Jambavan was a devotee of Lord Ramachandra, clouded by his anger he did not recognize Krishna to be the same Supreme Personality of Godhead. There was a great fight between them, which lasted 28 days without stopping. Jambavan was the strongest living entity at that time, so he expected to defeat Krishna. After 28 days, Jambavan had perspiration all over his body and was extremely tired. He realized that the person he was fighting must be the Supreme Lord, Who is the source of all strength and all kinds of opulence. He offered prayers to Lord Krishna, and hearing of the Lord’s desire, he gave him the Syamantaka jewel. 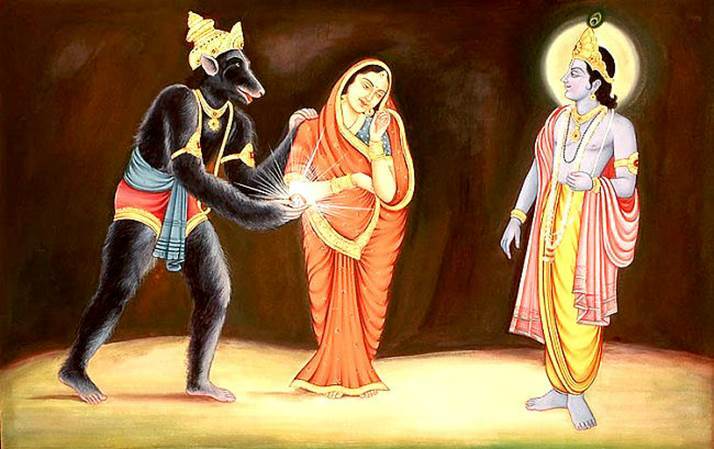 He then presented his daughter, Jambavati, to be married to Lord Krishna. Lord Krishna then out of His causeless mercy to His dear-devotee showed His form of Lord Ramacandra. 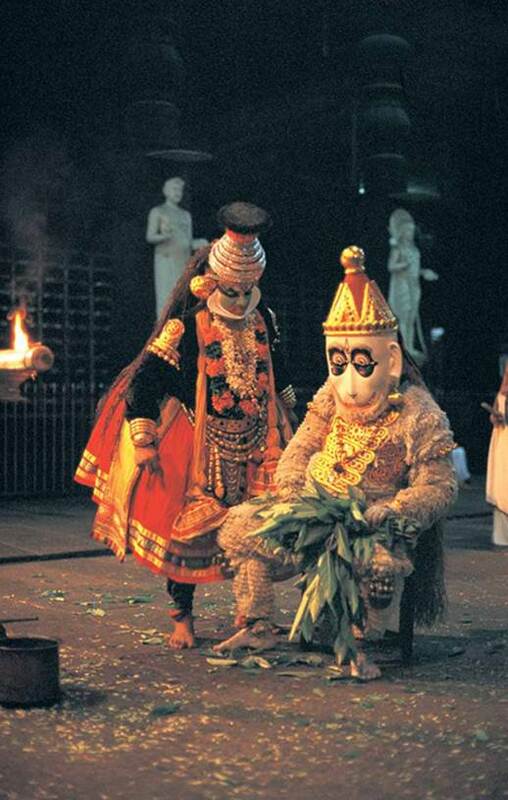 Jambavan mentions two incidents in his life in the Ramayana. (1) Once at the foot of Mount Mahendra, where Hanuman was about to take a leap, he mentions that he could have jumped over the ocean to Lanka except that he got injured when he was beating the drum for Vishnu during the Vamana avatar when the Supreme God measured the three worlds. Vamana’s shoulder struck Jambavan and he was injured which limited his mobility. He said this while he was encouraging Hanuman to cross the 100 yojana sea and go to Lanka in search of Sita. (2) He was present during the churning of the ocean and thus witnessed Kurma avatar. He got to know about the all-curing plant Vishalyakarni. 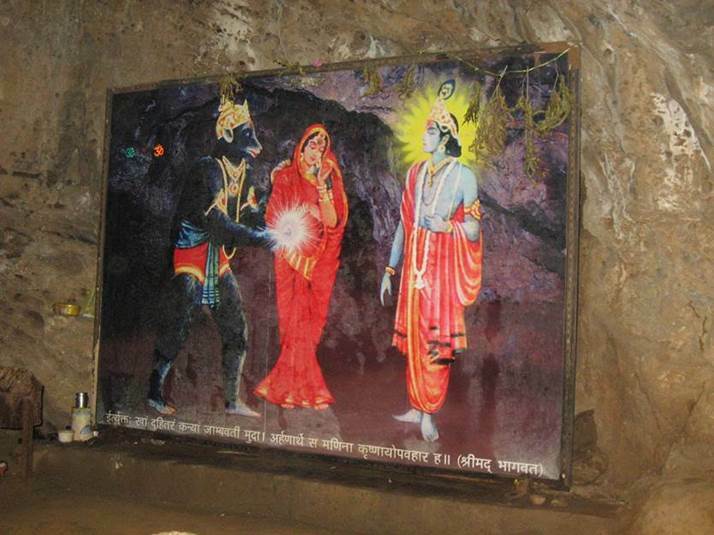 He later used this information to convey Hanuman to help injured Laxmana who was rendered unconscious by Indrajit. Once during a duel with Ravana, Jambavan was quick and ferocious. He gave Ravana mighty punches with his hands and finally kicked him on his chest, knocking Ravana unconscious and making him fall flat in his chariot. As a result, the charioteer withdrew Ravana from the battle. He was considered very experienced and intelligent. He had a good knowledge of running a kingdom. 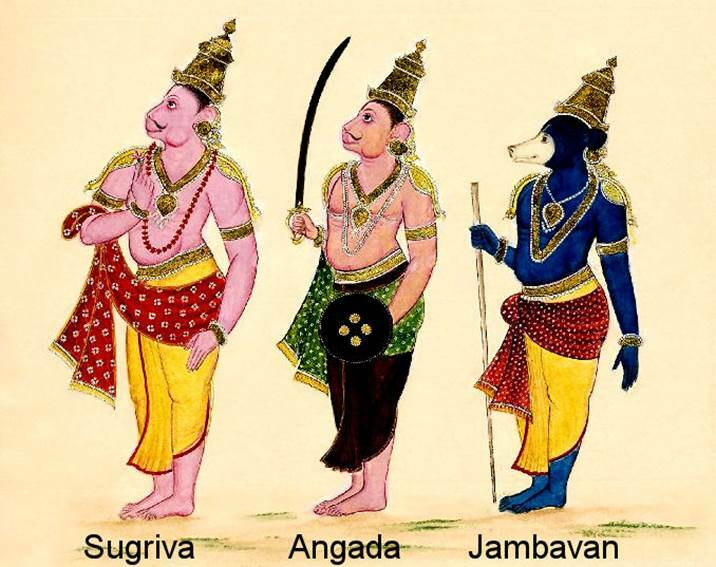 Sugriva’s advisers included Jambavan, Nala, Neela, Hanuman and a few others. Sugriva was residing on mount Rishyamukha with these advisers. 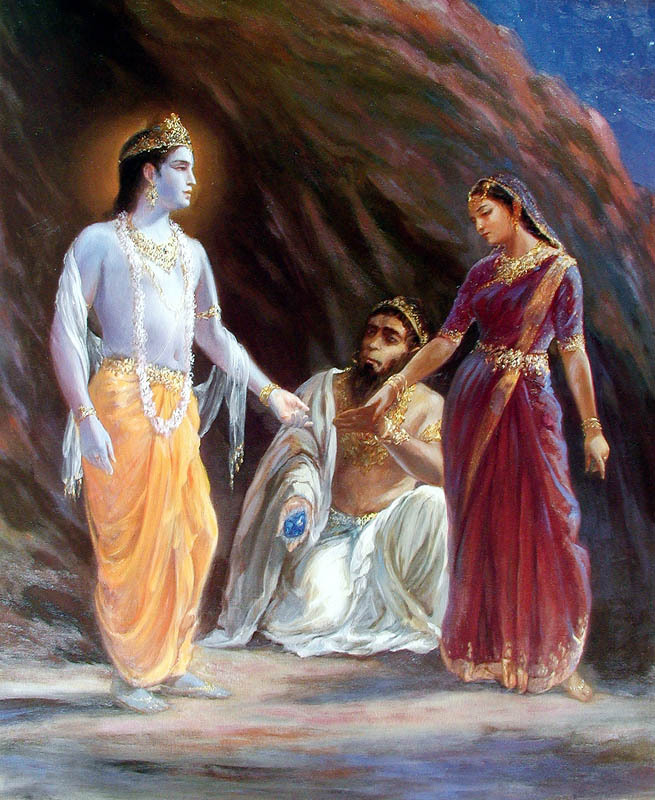 Jambavan advised Sugriva to send Hanuman to identify Rama and Laxmana, to find out who they were and what their purpose was. Apart from all the appellations that can ascribe to Jambavan, the foremost is that he was a great devotee and eternal servant of Lord Ramacandra. He was bestowed with the boon that he would be able to see Lord Rama when He descents again as Lord Krishna in His next avatar. 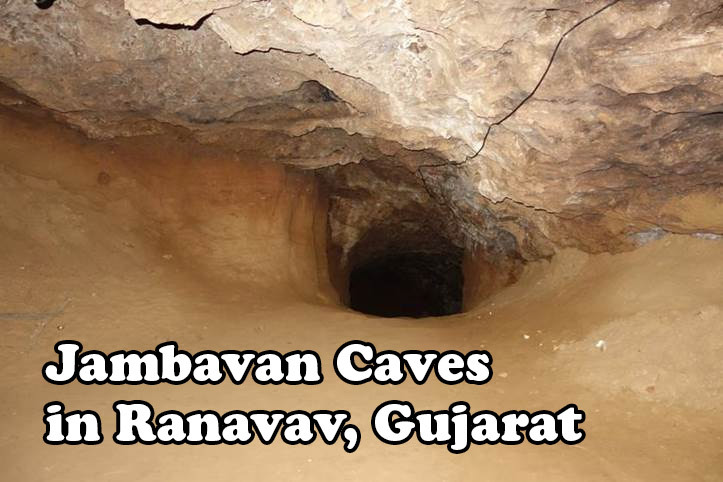 Jambavan cave is located at village named Ranavav which is 17 km from Porbandar, off Rajkot-Porbandar highway. 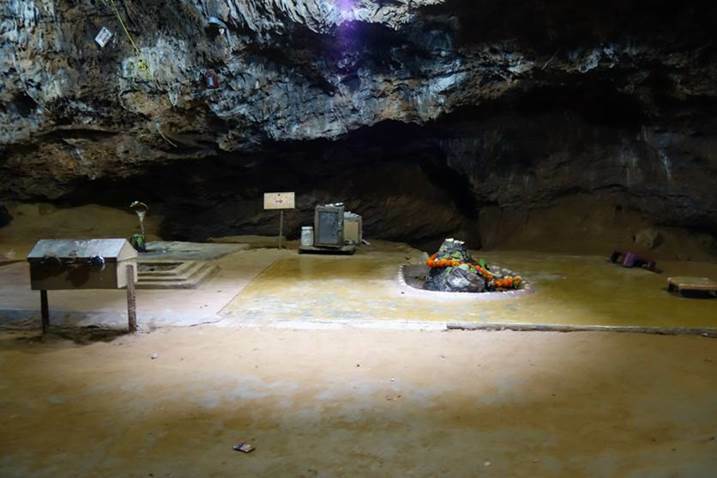 Inside the cave there is the spot where Lord Krishna and Jambavan fought over the Syamantaka jewel for 28 days continuously day and night, non-stop. On 28th day Jambavan realized that he is fighting with Supreme Lord Sri Krishna who is non-different from his beloved Lord Ramacandra. 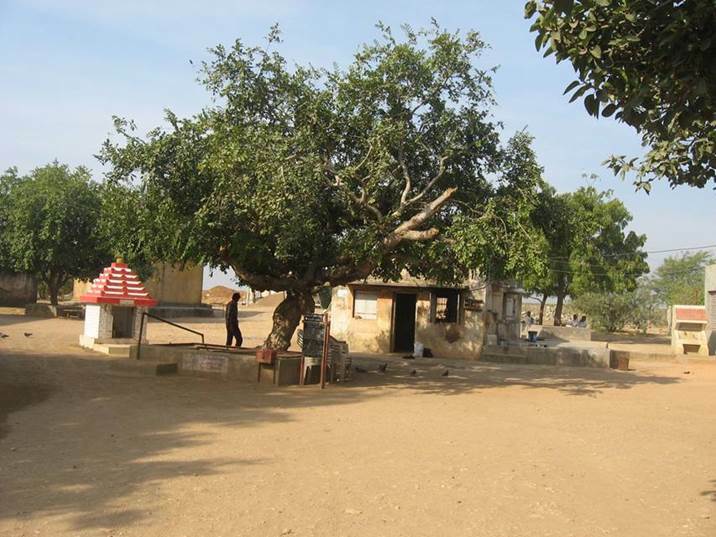 There is the exact spot where Jambavan gave Syamantaka jewel and gifted his daughter Jambavati for marriage to Lord Krishna. Inside the cave there are two tunnels. 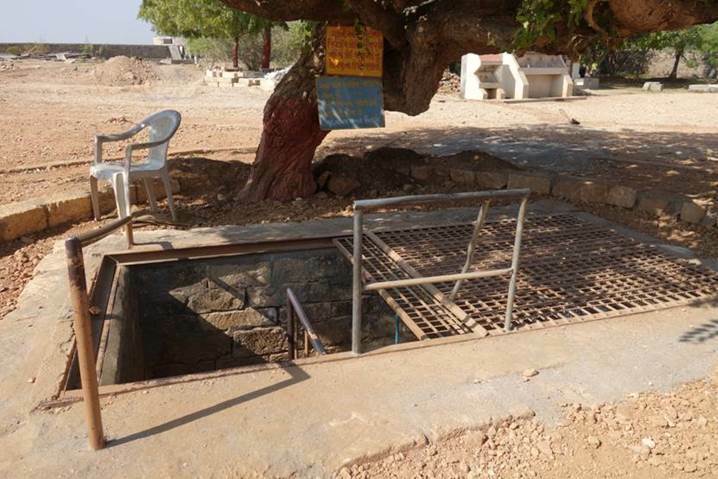 One tunnel leads to Junagarh which is 2 hours away, and other leads to Sri Dwarka Dhama. 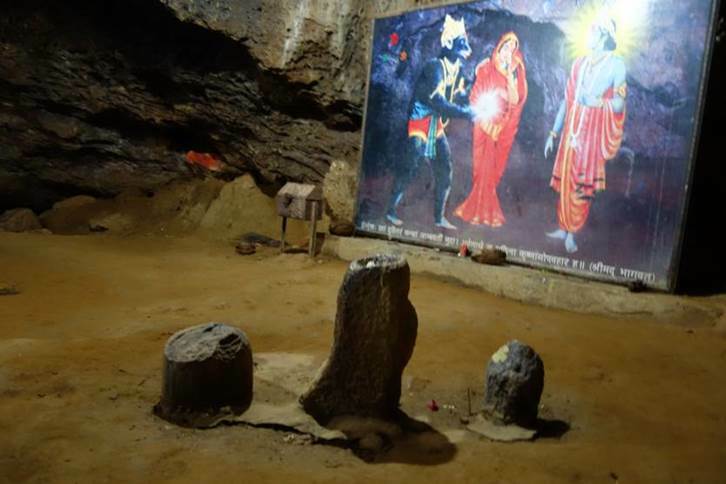 Inside the cave are naturally formed Siva-linga’s made by sand when the water falls from the roof of the cave. 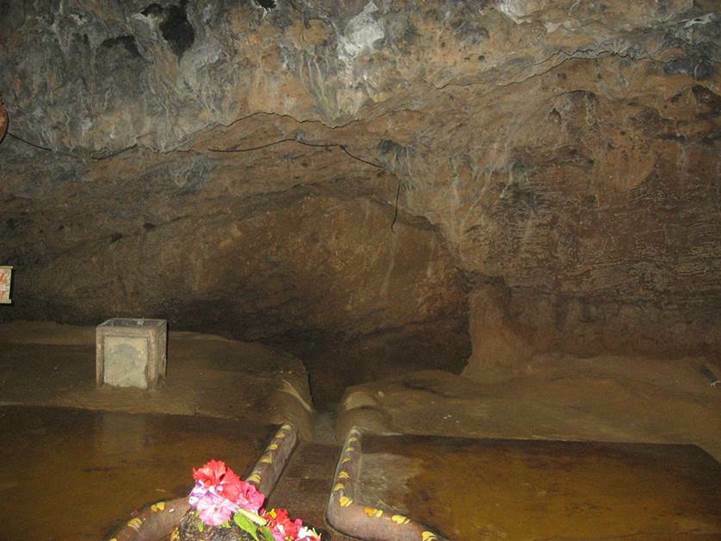 Outside the cave there is a Lord Rama temple and samadhi of guru Ramdas ji who did tapasya there. Every year a big fair is celebrated at this place. 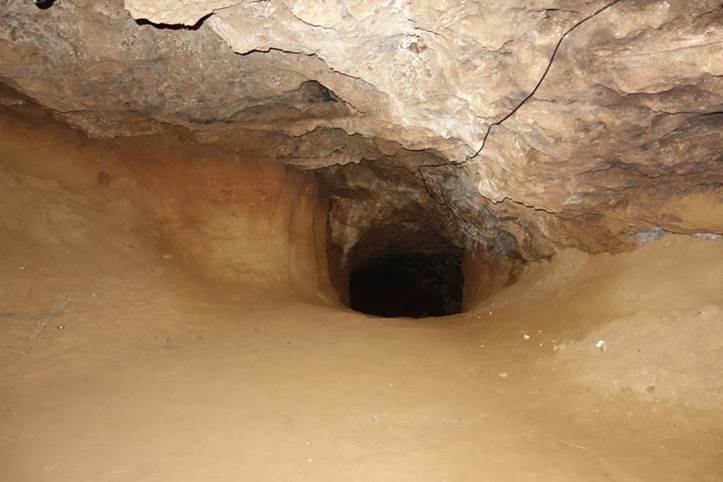 Jambavan Cave is located just behind Haiti cement factory and is well connected by road. 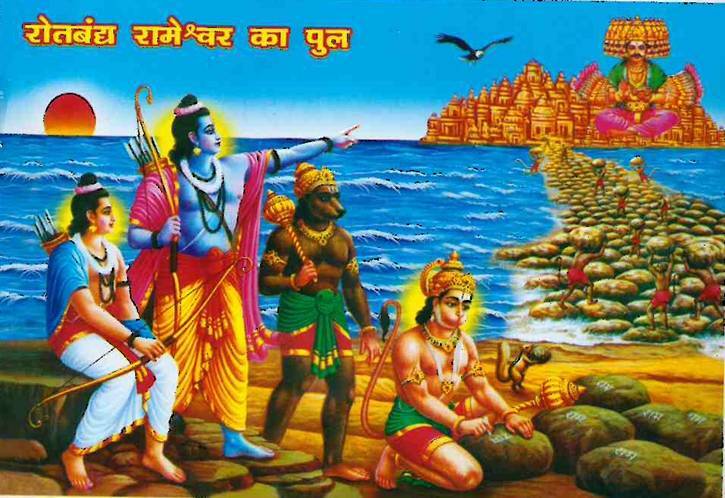 Jambavan saw both Lord Rama in Treta-yoga and Lord Krishna in Dvapara-yuga. In the Mahabharata, Jambavan had killed a lion, who had acquired a gem called Syamantaka from Prasena after killing him. Lord Krishna was suspected of killing Prasena for the jewel, so Lord tracked Prasena’s steps until He learned that Prasena had been killed by a lion who had been killed by a bear. 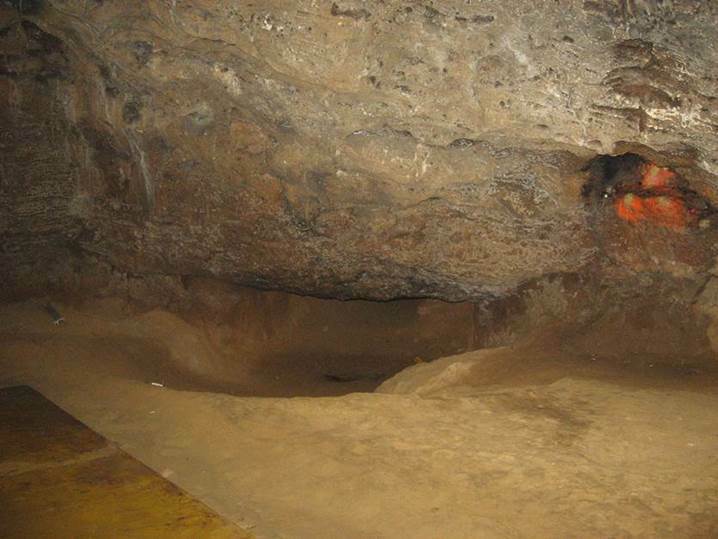 Lord Krishna tracked Jambavan to his cave. When the nurse of Jambavan’s child saw Krishna coming, she immediately thought He might take away the valuable Syamantaka jewel, and she cried out in fear. Jambavan heard her and went there in an angry mood. Seeing Krishna, he challenged Him to fight. Although Jambavan was a devotee of Lord Rama, clouded by his anger he did not recognize Krishna to be the same Supreme Personality of Godhead. There was a great fight between them, which lasted 28 days without stopping. Jambavan was the strongest living entity at that time, so he expected to defeat Krishna. After 28 days, Jambavan had perspiration all over his body and was extremely tired. He realized that the person he was fighting must be the Supreme Lord, Who is the source of all strength and all kinds of opulence. He offered prayers to Lord Krishna, and hearing of the Lord’s desire, he gave him the Syamantaka jewel. He then presented his daughter, Jambavati, to be married to Lord Krishna. Lord Krishna then out of His causeless mercy to His dear-devotee showed His form of Lord Ramacandra. 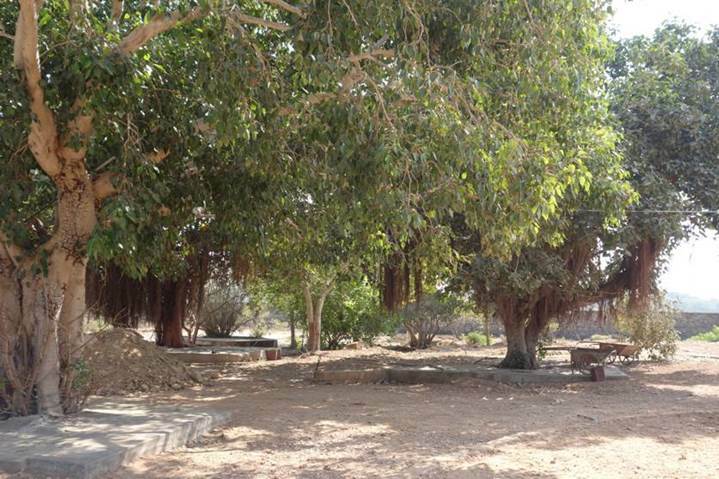 Place where Jambavan lived. 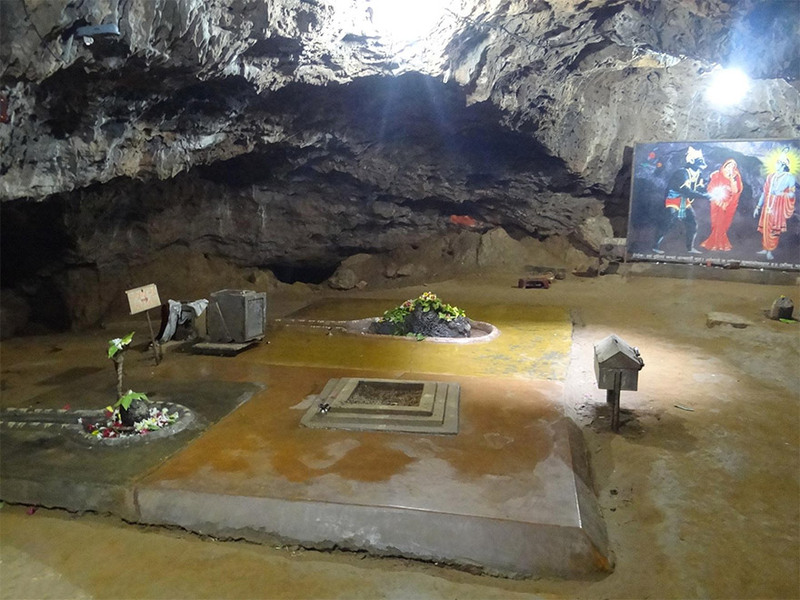 Both Jambavan and Lord Krishna fought here for 28 days for Syamantaka jewel, when Jambavan finally realized that the person he is fighting with is the Lord of his heart, Lord Krishna who is non-different from Lord Rama. 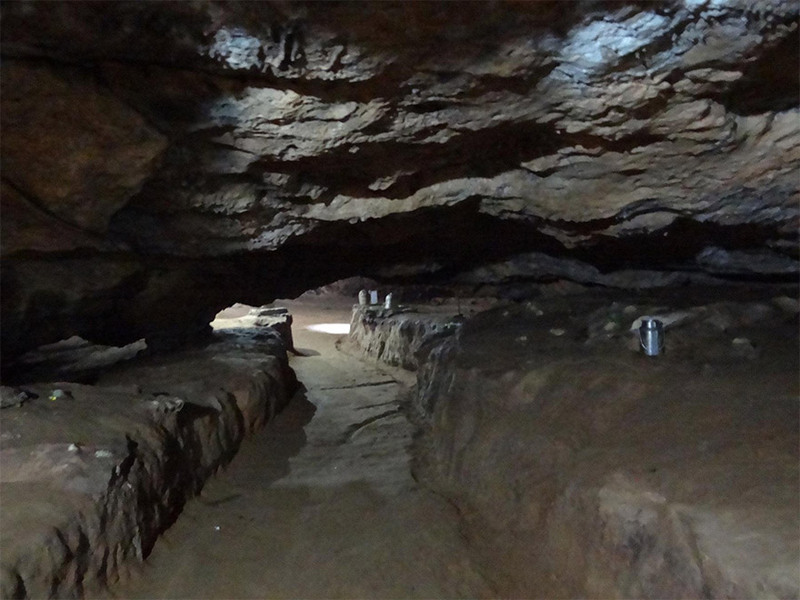 Inside the cave are naturally formed Siva-linga’s made by sand when the water falls from the roof of the cave. This statement is very instructive to the ordinary man, who is amazed by the activities of a person with an exceptional brain. The ordinary man is surprised to see the inventions of a great scientist, but the statement of Jambavan confirms that although a scientist may be a creator of many wonderful things, Lord Krishna is the creator of the scientist. He is the creator of not only one scientist but of millions and trillions, all over the universe. Jambavan said further, “Not only are You the creator of the creators, but You are also the creator of the material elements which the so-called creators manipulate.” Scientists utilize the physical elements or laws of material nature to do something wonderful, but actually such laws and elements are also the creation of Krishna. This is actual scientific understanding. Less intelligent men do not try to understand who created the brain of the scientist; they are satisfied simply to see the wonderful creation or invention of the scientist. Lord Krishna was satisfied by the prayers of Jambavan, and to mitigate Jambavan’s pain, He began to stroke the lotus palm of His hand all over Jambavan’s body. Thus Jambavan at once felt relieved from the fatigue of the great fight. 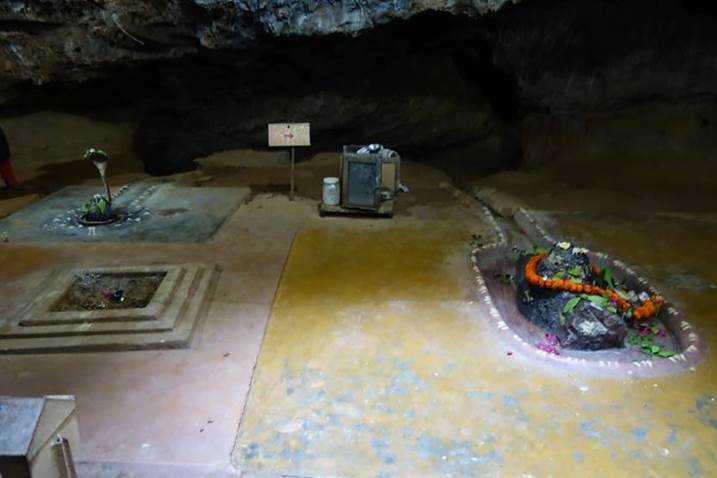 Inside Jambavan’s cave there are two tunnels, one leading to Sri Dwarka Dhama which is about 2½ hours from Jambavan caves and the other tunnel leading to Junagarh which is about 2 hours from here. 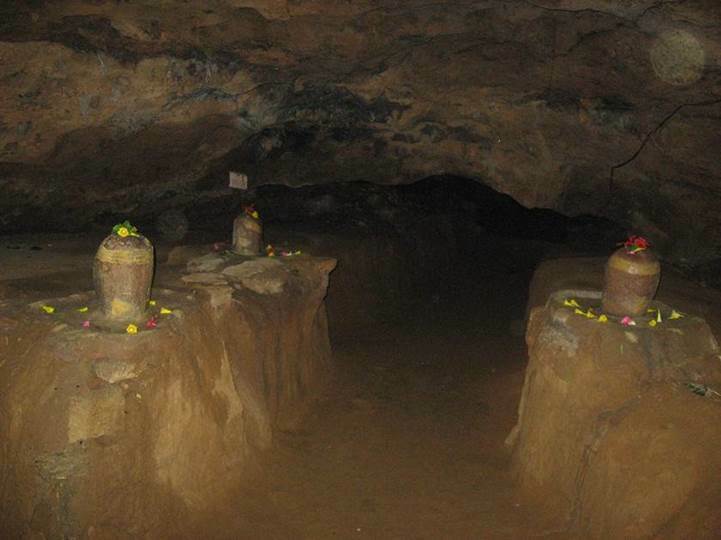 Inside the cave are naturally formed Siva-linga’s made by sand when the water falls from the roof of the cave. Lord Ramacandra’s allies: Sugriva, king of the vanaras, followed by Angada and Jambavan, king of the bears. Sugriva carries a flower in his right hand and a garland of red flowers hangs over his chest. All three wear dhotis with the angavastra (shawl) elegantly draped around their hips. Angada carries a sword and shield and Jambavan has a long stick. Jambavan was considered very experienced and intelligent. He had a good knowledge of running a kingdom. Sugriva’s advisers included Jambavan, Nala, Neela, Hanuman and a few others. Sugriva was residing on mount Rishyamukha with these advisers. Jambavan advised Sugriva to send Hanuman to identify Rama and Laxmana, to find out who they were and what their purpose was. Jambavan was very powerful when he was young. He said this while he was encouraging Hanuman to cross the 100 yojana sea and go to Lanka in search of Sita. Jambavan was so powerful that he circled Lord Vamana seven times in brief time when Lord was acquiring the three worlds from Bali Maharaj. So he could have easily jumped 100 yojana Sea had he been young. Once during a duel with Ravana, Jambavan was quick and ferocious. He gave Ravana mighty punches with his hands and finally kicked him on his chest, knocking Ravana unconscious and making him fall flat in his chariot. As a result, the charioteer withdrew Ravana from the battle. Apart from all the appellations that can ascribe to Jambavan, the foremost is that he was a great devotee and eternal servant of Lord Ramacandra. He was bestowed with the boon that he would be able to see Lord Rama when He descents again as Lord Krishna in His next incarnation. In the Krishna book published by BBT (Bhaktivedanta Book Trust publications), the chapter 56 “The Story of the Syamantaka Jewel” describes the wonderful pastime of Lord Sri Krishna with Jambavan as follows. There was a king of the name Satrajit within the jurisdiction of Dwarka-Dhama. He was a great devotee of the sun-god, who awarded him the benediction of a jewel known as Syamantaka. Because of this Syamantaka jewel, there was a misunderstanding between King Satrajit and the Yadu dynasty Later the matter was settled when Satrajit voluntarily offered Krishna his daughter, Satyabhama, along with the Syamantaka jewel. Not only Satyabhama but also Jambavati, the daughter of Jambavan, was married to Krishna on account of the Syamantaka jewel. These two marriages took place before the appearance of Pradyumna, as described in the last chapter. How King Satrajit offended the Yadu dynasty and how he later came to his senses and offered his daughter and the Syamantaka jewel to Krishna are described as follows. Since he was a great devotee of the sun-god, King Satrajit gradually entered into a very friendly relationship with him. The sun-god was pleased with him and delivered to him an exceptional jewel known as Syamantaka. When Satrajit wore this jewel in a locket around his neck, he appeared exactly like an imitation sun-god. Putting on this jewel, he entered the city of Dwarka, and people thought that the sun-god had come into the city to see Krishna. They knew that Krishna, being the Supreme Personality of Godhead, was sometimes visited by the demigods, so while Satrajit was visiting the city of Dwarka all the inhabitants except Krishna took him to be the sun-god himself. Although King Satrajit was known to everyone, he could not be recognized because of the dazzling effulgence of the Syamantaka jewel. That Lord Krishna is the Supreme Personality of Godhead, Narayana, as accepted by the citizens of Dwarka, was later confirmed by the great Mayavadi philosophical leader Sankaracarya. By accepting the Lord as impersonal, he did not reject the Lord’s personal form. Everything which has form in this material world is subject to creation, maintenance and annihilation, but because the Supreme Personality of Godhead, Narayana, does not have a material form subject to these limitations, Sankaracarya, to convince the less intelligent men who take Krishna to be an ordinary human being, said that God is impersonal. This impersonality means that He is not a person of this material condition. Lord Sri Krishna is a transcendental personality without a material body. The citizens of Dwarka addressed Lord Krishna not only as Damodara but also as Govinda, which indicates that Krishna is very affectionate to the cows and calves; and just to refer to their intimate connection with Krishna, they addressed Him as Yadunandana because He was born the son of Vasudeva in the Yadu dynasty. In this way, the citizens of Dwarka concluded by addressing Lord Krishna as the supreme master of the whole universe. They addressed Lord Krishna in many different ways, proud of being citizens of Dwarka who could see Krishna daily. When Satrajit was visiting the city of Dwarka, the citizens felt great pride to think that although Krishna was living in Dwarka like an ordinary human being, the demigods were coming to see Him. Thus they informed Lord Krishna that the sun-god, with his glaring bodily effulgence, was coming to see Him. 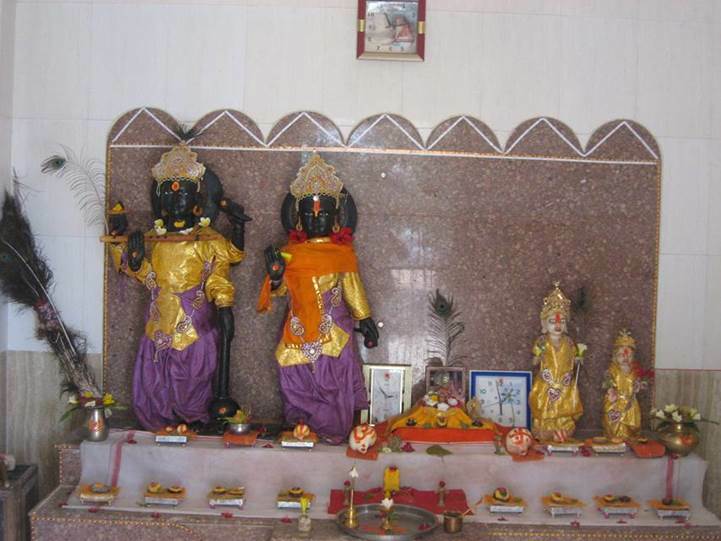 The citizens of Dwarka confirmed that the sun-god’s coming into Dwarka was not very wonderful, because people all over the universe who were searching after the Supreme Personality of Godhead knew that He had appeared in the Yadu dynasty and was living in Dwarka as one of the members of that family. Thus the citizens expressed their joy on this occasion. On hearing the statements of His citizens, the all-pervasive Personality of Godhead, Krishna, simply smiled. Being pleased with the citizens of Dwarka, Lord Krishna informed them that the person they described as the sun-god was actually King Satrajit, who had come to visit Dwarka City to show his opulence in the form of the valuable jewel obtained from the sun-god. Satrajit, however, did not come to see Krishna; he was instead overwhelmed by the Syamantaka jewel. 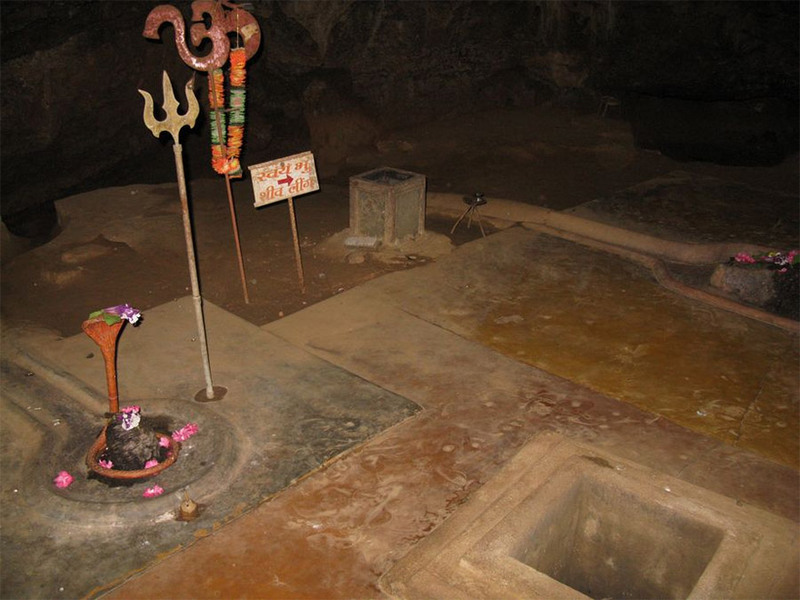 He installed the jewel in a temple to be worshiped by brahmanas he engaged for this purpose. This is an example of a less intelligent person worshiping a material thing. In the Bhagavad-Gita it is stated that less intelligent persons, in order to get immediate results from their fruitive activities, worship the demigods created within this universe. The word materialist means one concerned with gratification of the senses within this material world. Although Krishna later asked for this Syamantaka jewel, King Satrajit did not deliver it; on the contrary, he installed the jewel for his own purposes of worship. And who would not worship that jewel? The Syamantaka jewel was so powerful that daily it produced a large quantity of gold. A quantity of gold is counted by a measurement called a bhara. According to Vedic formulas, one bhara is equal to about twenty-one pounds, and one mound equals about eighty-two pounds. 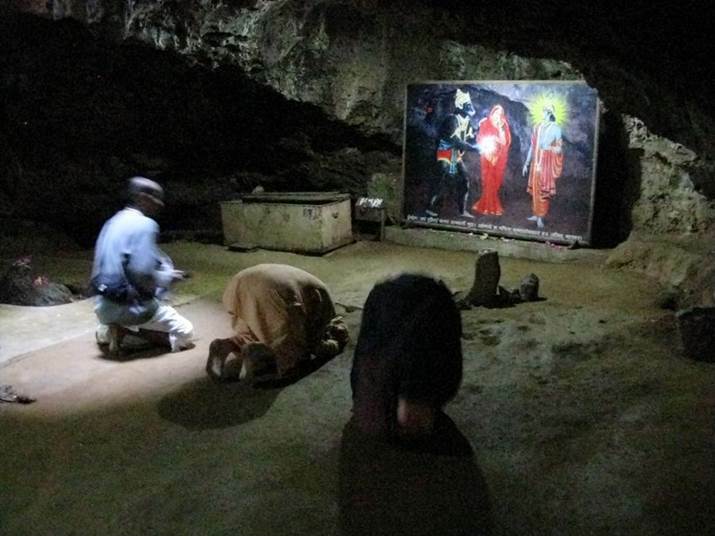 The jewel was producing about 170 pounds of gold every day. Besides that, it is learned from Vedic literature that in whatever part of the world this jewel was worshiped there was no possibility of famine, and wherever the jewel was present, there was no possibility of anything inauspicious, such as pestilence. Lord Krishna wanted to teach the world that the best of everything should be offered to the ruling chief of the country. King Ugrasena was the overlord of many dynasties and happened to be the grandfather of Krishna, so Krishna asked Satrajit to present the Syamantaka jewel to King Ugrasena. Krishna pleaded that the best should be offered to the King. But Satrajit, being a worshiper of the demigods, had become too materialistic and, instead of accepting the request of Krishna, thought it wiser to worship the jewel to get the 170 pounds of gold every day. Materialistic persons who can achieve such huge quantities of gold are not interested in Krishna consciousness. Sometimes, therefore, to show special favor, Krishna takes away one’s great accumulations of materialistic wealth and thus makes one a great devotee. But Satrajit refused to abide by the order of Krishna and did not deliver the jewel. After this incident, Satrajit’s younger brother, in order to display the opulence of the family, took the jewel, put it on his neck and rode on horseback into the forest, making a show of his material opulence. 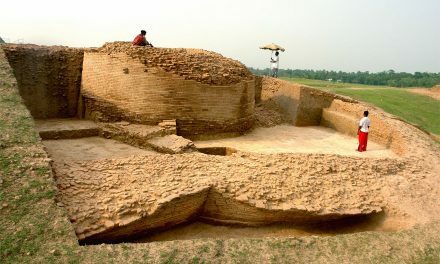 While Satrajit’s brother, who was known as Prasena, was moving here and there in the forest, a big lion attacked him, killing both him and the horse on which he was riding, and took away the jewel to his cave. News of this was received by the gorilla king, Jambavan, who then killed that lion in the cave and took away the jewel. Jambavan had been a great devotee of the Lord since the time of Lord Ramacandra, so he did not take the valuable jewel as something he very much needed. He gave it to his young son to play with as a toy. In the city, when Satrajit’s younger brother Prasena did not return from the forest with the jewel, Satrajit became very upset. He did not know that his brother had been killed by a lion and that the lion had been killed by Jambavan. He thought instead that because Krishna wanted that jewel, which had not been delivered to Him, Krishna might have therefore taken the jewel from Prasena by force and killed him. 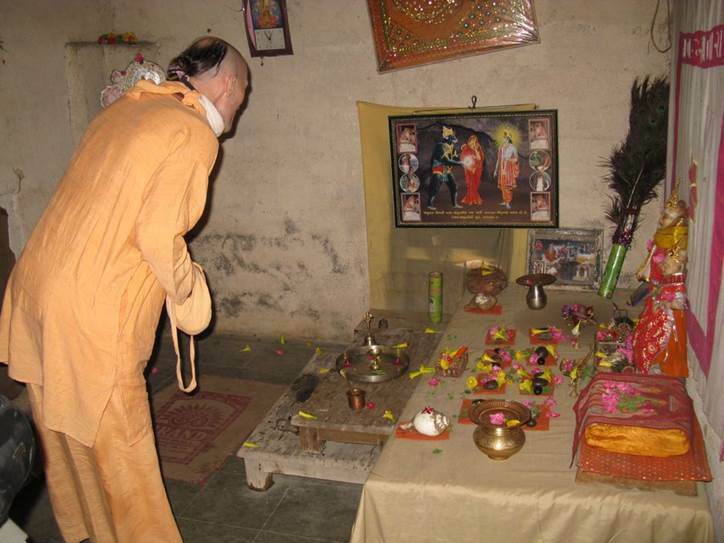 This idea grew into a rumor, which Satrajit spread in every part of Dwarka. The false rumour that Krishna had killed Prasena and taken away the jewel spread everywhere like wildfire. Lord Sri Krishna did not like to be defamed in that way, and therefore He decided that He would go to the forest and find the Syamantaka jewel. Taking with Him some of the important inhabitants of Dwarka, Krishna went to search out Prasena, the brother of Satrajit, and found him dead, killed by the lion. At the same time, Krishna also found the lion killed by Jambavan, who is generally called Rksa. It was found that the lion had been killed by the hand of Rksa without the assistance of any weapon. 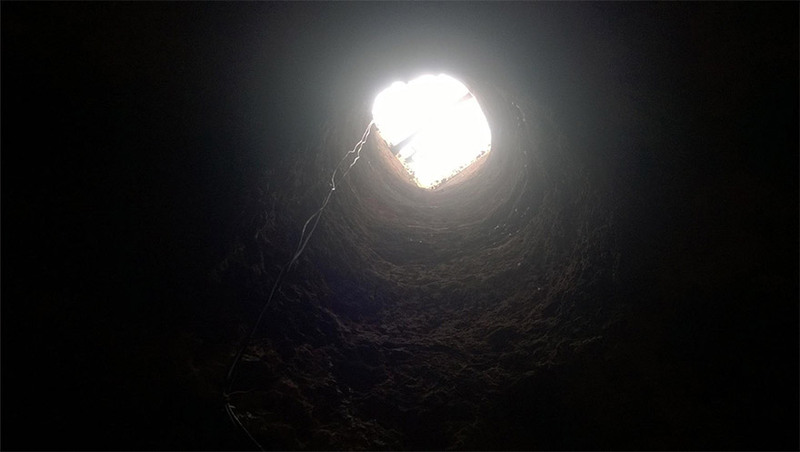 Lord Krishna and the citizens of Dwarka then found in the forest a great tunnel, said to be the path to Rksa’s house. 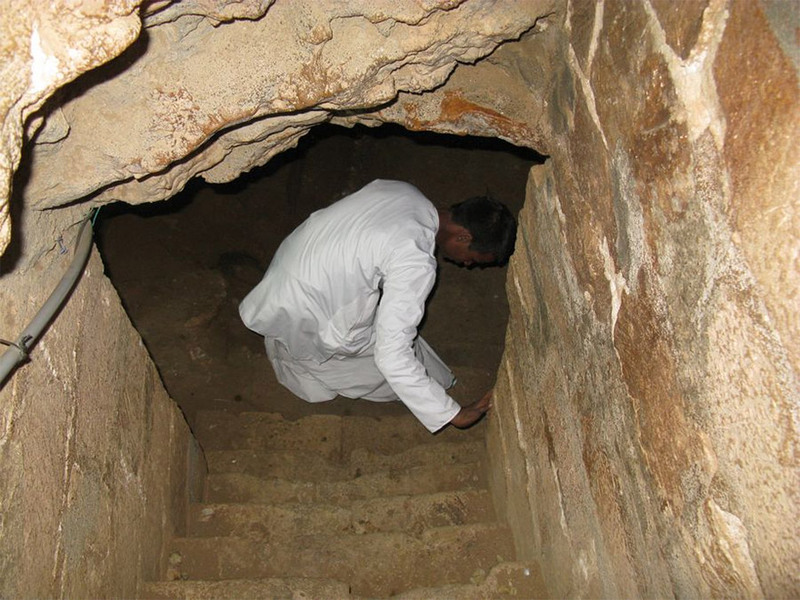 Krishna knew that the inhabitants of Dwarka would be afraid to enter the tunnel; therefore He asked them to remain outside, and He Himself entered the dark tunnel alone to find Rksa, Jambavan. After entering the tunnel, Krishna saw that the valuable jewel known as Syamantaka had been given to the son of Rksa as a toy. To take the jewel from the child, Krishna approached and stood before him. When the nurse taking care of Rksa’s child saw Krishna standing before her, she was afraid, thinking He might take away the valuable Syamantaka jewel, and she cried loudly out of fear. Hearing the nurse crying, Jambavan appeared on the scene in a very angry mood. Jambavan was actually a great devotee of Lord Krishna, but because he was angry he could not recognize his master and thought Him to be an ordinary man. This brings to mind the statement of the Bhagavad-Gita in which the Lord advises Arjuna to get free from anger, greed and lust in order to rise to the spiritual platform. Lust, anger and greed run parallel in the heart and check one’s progress on the spiritual path. 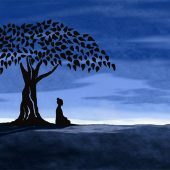 Not recognizing his master, Jambavan challenged Him to fight. There was then a great fight between Krishna and Jambavan, in which they fought like two opposing vultures. Whenever there is an eatable corpse the vultures fight heartily over the prey. Krishna and Jambavan first of all fought with weapons, then with stones, then with big trees, then hand to hand, until at last they were hitting each other with their fists, their blows like the striking of thunderbolts. Each expected victory over the other, but the fighting continued for twenty-eight days, both in daytime and at night, without stopping. Although Jambavan was the strongest living entity of that time, practically all the joints of his bodily limbs became slackened and his strength was reduced practically to nil, for he was struck constantly by the fists of Sri Krishna. Feeling very tired, with perspiration all over his body, Jambavan was astonished. Who was this opponent who was fighting so hard with him? Jambavan was quite aware of his own superhuman bodily strength, but when he felt tired from being struck by Lord Krishna, he could understand that Krishna was no one else but his worshipable Lord, the Supreme Personality of Godhead. 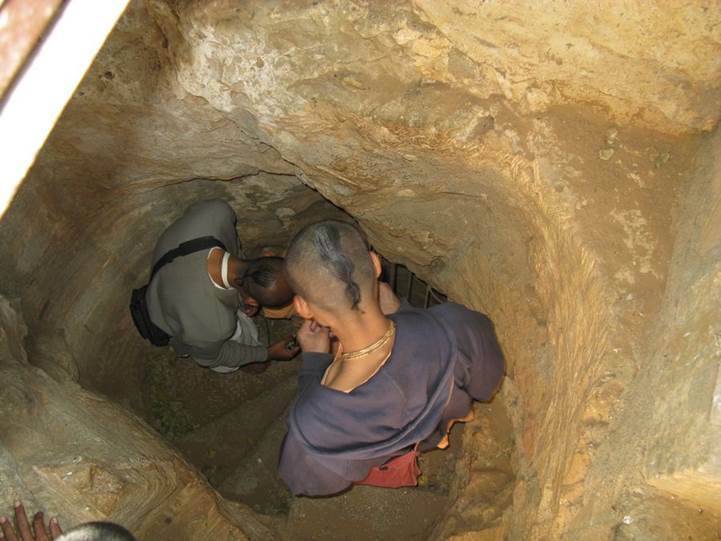 This incident has special significance for devotees. In the beginning, Jambavan could not understand Lord Sri Krishna because his vision was obscured by material attachment. 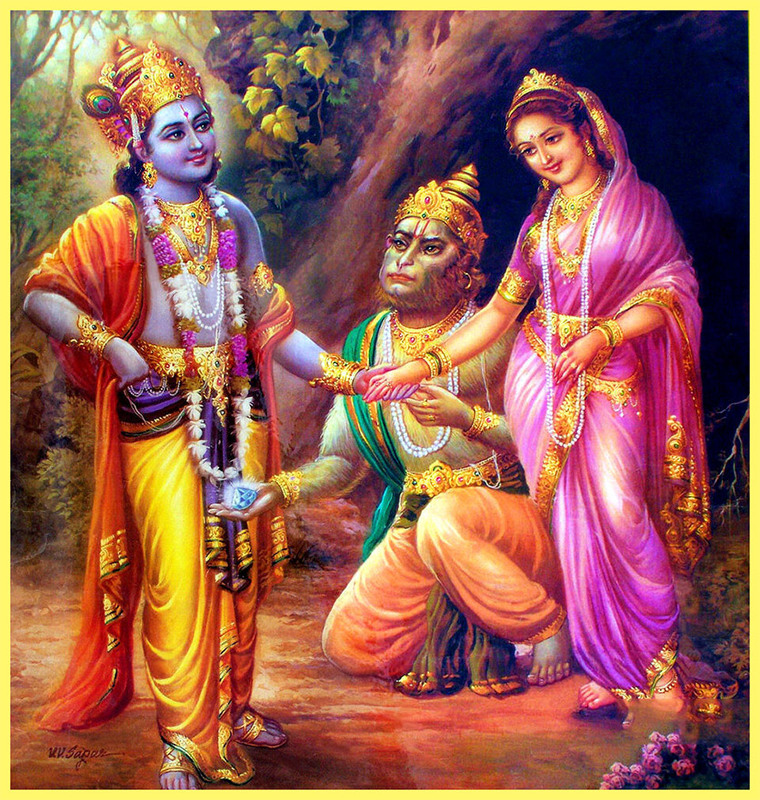 He was attached to his boy and to the greatly valuable Syamantaka jewel, which he did not want to spare for Krishna. In fact, when Lord Krishna came there he was angry, thinking that Krishna had come to take away the jewel. This is the material position: although one is very strong in body, that cannot help him understand Lord Krishna. In a sporting attitude, Lord Sri Krishna wanted to engage in a mock fight with His devotee. As we have experienced from the pages of Srimad-Bhagavatam, the Supreme Personality of Godhead has all the propensities and instincts of a human being. Sometimes, in a sportive spirit, He wishes to fight to make a show of bodily strength, and when He so desires, He selects one of His suitable devotees to give Him that pleasure. Krishna desired this pleasure of mock fighting with Jambavan. Although Jambavan was a devotee by nature, he was without knowledge of Krishna while giving service to the Lord by his bodily strength. But as soon as Krishna was pleased by the fighting, Jambavan immediately understood that his opponent was none other than the Supreme Lord Himself. The conclusion is that he could understand Lord Krishna by his service, for Krishna is sometimes satisfied by fighting also. This statement is very instructive to the ordinary man, who is amazed by the activities of a person with an exceptional brain. The ordinary man is surprised to see the inventions of a great scientist, but the statement of Jambavan confirms that although a scientist may be a creator of many wonderful things, Lord Sri Krishna is the creator of the scientist. He is the creator of not only one scientist but of millions and trillions, all over the universe. Scientists utilize the physical elements or laws of material nature to do something wonderful, but actually such laws and elements are also the creation of Krishna. This is actual scientific understanding. Less intelligent men do not try to understand who created the brain of the scientist; they are satisfied simply to see the wonderful creation or invention of the scientist. Lord Krishna was satisfied by the prayers and statements of Jambavan, and to mitigate Jambavan’s pain, He began to stroke the lotus palm of His hand all over Jambavan’s body. Thus Jambavan at once felt relieved from the fatigue of the great fight. Lord Krishna then addressed him as King Jambavan because he, and not the lion, was actually the king of the forest, having killed the lion with his bare hands, without a weapon. Lord Krishna informed Jambavan that He had come to ask for the Syamantaka jewel because ever since the Syamantaka jewel had been stolen His name had been defamed by the less intelligent. Krishna plainly informed him that He had come there to ask for the jewel in order to be free from this defamation. Jambavan understood the whole situation, and to satisfy the Lord he immediately delivered not only the Syamantaka jewel but also his daughter Jambavati, who was of marriageable age, and presented her to Lord Krishna. 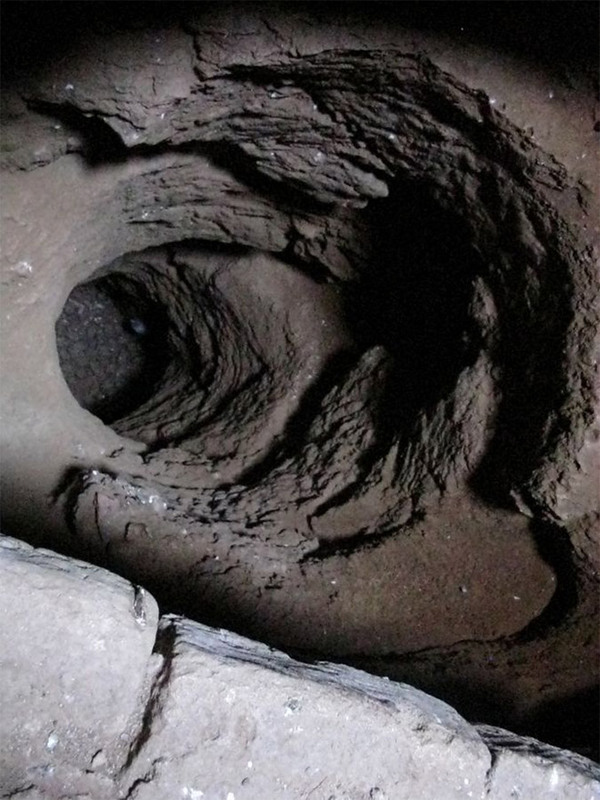 Although the fighting between Krishna and Jambavan went on for 28 days, the inhabitants of Dwarka waited outside the tunnel for 12 days, and after that they decided that something undesirable must have happened. They could not understand for certain what had actually happened, and being very sorry and tired they returned to the city of Dwarka. All the members of the family, namely Krishna’s mother, Devaki, His father, Vasudeva, and His chief wife, Rukmini, along with all other friends, relatives and residents of the palace, were very sorry when the citizens returned home without Krishna. Because of their natural affection for Krishna, they began to call Satrajit ill names, for he was the cause of Krishna’s disappearance. 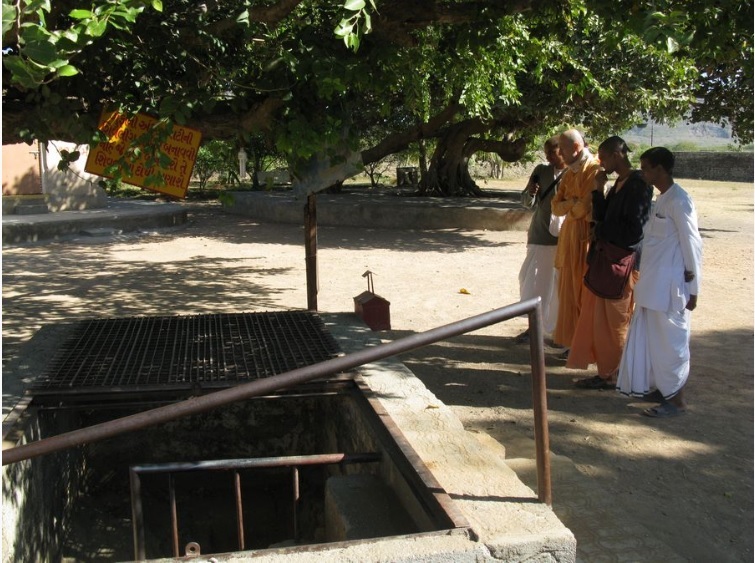 They went to worship the goddess Candrabhaga, praying for the return of Krishna. The goddess was satisfied by the prayers of the citizens of Dwarka, and she immediately offered them her benediction. Simultaneously, Krishna appeared on the scene, accompanied by His new wife, Jambavati, and all the inhabitants of Dwarka and relatives of Krishna became joyful. The inhabitants of Dwarka were as joyful as someone receiving a dear relative back from the dead. They had concluded that Krishna had been put into great difficulties due to the fighting; therefore, they had become almost hopeless of His return. But when they saw that Krishna had actually returned, not alone but with a new wife, Jambavati, they immediately performed a ceremony of celebration. King Ugrasena then called for a meeting of all important kings and chiefs. He also invited Satrajit, and Krishna explained before the whole assembly the incident of the recovery of the jewel from Jambavan. Krishna wanted to return the valuable jewel to King Satrajit. Satrajit, however, was ashamed because he had unnecessarily defamed Krishna. He accepted the jewel in his hand, but he remained silent, bending his head downwards, and without saying anything in the assembly of the kings and chiefs, he returned home with the jewel. Then he thought about how he could clear himself of the abominable act he had performed by defaming Krishna. He was conscious that he had offended Krishna very grievously and that he had to find a remedial measure so that Krishna would again be pleased with him. King Satrajit was eager to get relief from the anxiety he had foolishly created due to being attracted by a material thing, specifically the Syamantaka jewel. Truly afflicted by the offense he had committed against Krishna, he sincerely wanted to rectify it. From within, Krishna gave him good intelligence, and Satrajit decided to hand over to Krishna both the jewel and his beautiful daughter, Satyabhama. There was no alternative for mitigating the situation, and therefore he arranged the marriage ceremony of Krishna and his daughter. He gave in charity both the jewel and his daughter to the Supreme Personality of Godhead. Satyabhama was so beautiful and qualified that Satrajit, in spite of being asked for her hand by many princes, was waiting to find a suitable son-in-law. By the grace of Krishna he decided to hand his daughter over to Him. 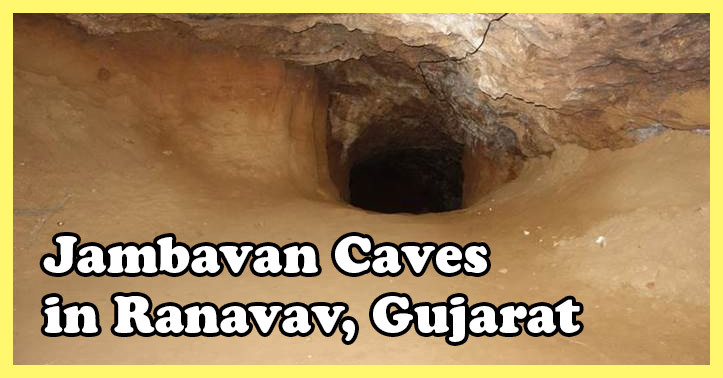 Jambavan cave is located at village named Ranavav, which is 17 km from Porbandar, off Rajkot-Porbandar highway. Landmark is: cave is just behind Haiti cement factory and is well connected by road, only half hour drive from Porbandar. 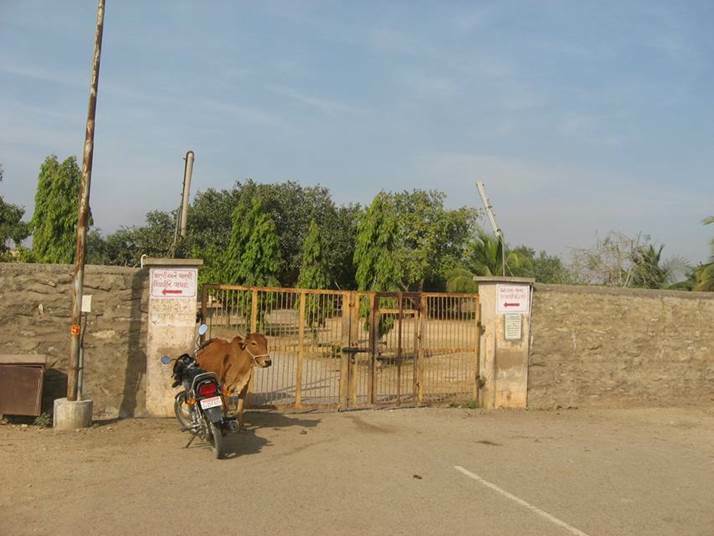 Porbandar is 2 hour’s drive from Sri Dwarka Dhama. I think Ramayana has more beautiful and greatly inspiring stories than our modern jungle book. The children should be introduced to the lively and divine stories of Ramayana which is sacred and both entertaining unlike Jungle book stories. 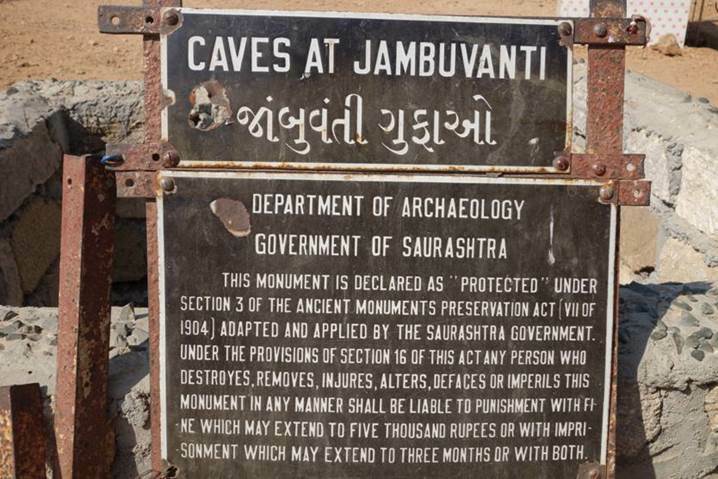 thanks for the information, if it is the will of Lord Krishna, I wish to visit Jambavan cave with my team. Only He has to call us. Surprise is the ladies of Bears -Janbavathi d/o Janbavan and Monkeys – Roma w/o Sugreeva are shown as beautiful humans.Our puranas have lots of amazing things. Thank you very much for bringing us the period of Hindu golden period. I felt that I have visited the place. Simply Beautiful. 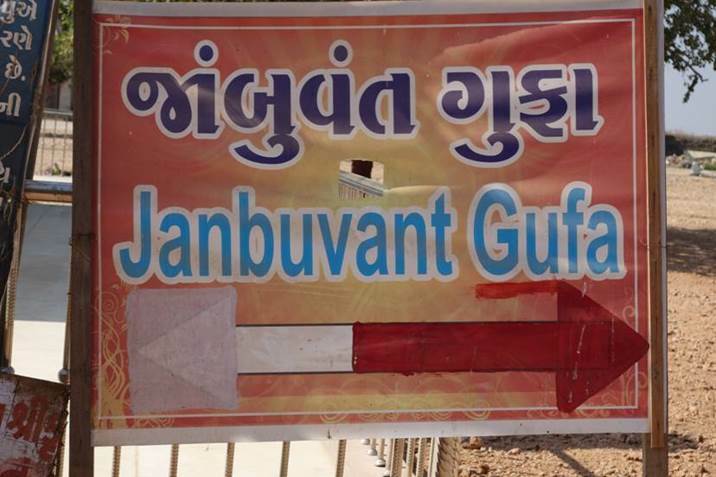 God willing some day I will visit Gujarat & try to have a look. The information given is exhaustive.